I grew up in a world where USA for Africa sang “We are the World” and so anytime anyone brings together a group of artists for a good cause, I pay attention. 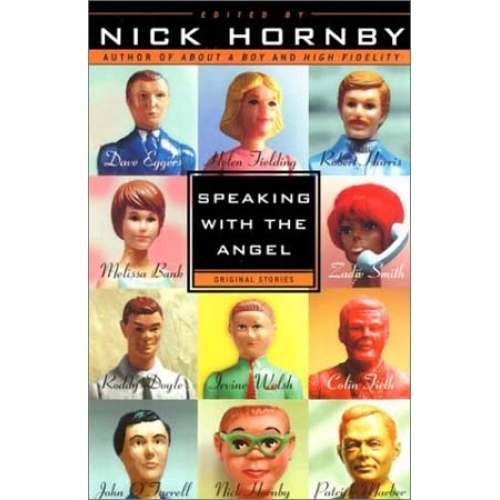 In Speaking with the Angel, Nick Hornby brought together a group of really well-known British writers to pen stories to benefit TreeHouse (a UK school for autistic children which his son attended). Of course if you buy the book in the US, the donation is split between TreeHouse and New York’s Child Learning Institute. And that alone made me look twice at the book. Giles Smith’s Last Requests- a story about the woman who prepares the last meals for people about to be executed. It’s a story that talks about the meals the condemned want and the meals her late husband ate. That was another one I found hard to read. Patrick Merber’s Peter Shelley is probably not for everyone. It’s a short story about a teenager’s first, clumsy but eager sexual encounter. Colin Firth’s The Department of Nothing—about a Grandmother who is dying, wants to go out one more time and gives her grandchild the gift of story-telling, possibly without even meaning to, I found really moving. The whole books is worth it if it was the only good story in it (in my opinion). But of course it isn’t. Zadie Smith’s-I’m the Only One I didn’t like all that much. But then I am not a big Zadie Smith fan so maybe I’m prejudiced. Nick Hornby’s NippleJesus was… wonderful. First of all, Nick Hornby so of course it was. But second of all it’s about how modern art and how easy we all are to manipulate. So, wonderful. Another short story that’s worth the whole book. Dave Eggers’ After I was Thrown in the River and before I Drowned is OK. I really wanted to like it for our dogs’ sakes but it’s just OK.
Ditto for Helen Fielding’s Luckybitch. I really wanted to like this because it’s Helen Fielding but… again, it’s just OK.
Roddy Doyle’s The Slave more than makes up for the preceding two stories. It’s a breathless monologue told by a guy who sees a dead rat and has a midlife crisis. OK, now that I described that, it sounds really dorky but Doyle makes it work. Irvine Welsh’s Catholic Guilt is hilarious. It’s about a homophobe who is punished by being made to walk the earth as a homosexual ghost. John O’Farrell’s Walking into the Wind about a Mime artist is just sad. Incredibly well written but really sad. But maybe it’s just that I like happy endings. So this anthology is filled with (almost) all good stories that are incredibly diverse. Perhaps you can say it’s about contemporary life but that’s about as much of a common theme as there is-which is to say, not much. Still, they’re great stories; the book introduced me to some great authors and it’s a great cause. I recommend it. This anthology is filled with (almost) all good stories that are incredibly diverse. Perhaps you can say it’s about contemporary life but that’s about as much of a common theme as there is-which is to say, not much. Still, they’re great stories; the book introduced me to some great authors and it’s a great cause. I recommend it.